OCR File Splitter is a program that is designed to monitor â€œwatchâ€� a file folder for the arrival of a multi-page Tiff image (facsimile). When one arrives it will be split into smaller multi-page Tiff images based upon the text content of the file. RingCentral fax over Internet service gives you advanced Internet faxing capability without having to own a fax machine. 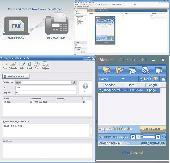 Popfax-printer is a printer driver application to send faxes.